You may have seen our favorite colorful kitchens. But if you are looking for ways to make a chic statement with a neutral hue, consider black. From cabinets to backsplashes, there is a multiple of ways you can work the inky shade into your cooking space. Whatever your decorating style, here are our favorite black kitchen ideas. Here is a chic wood-paneled cooking space by the interior design firm, The Vawdrey House. Black beadboard panels cover the cabinets and refrigerator. The mermaid inspired backsplash features iridescent scalloped tiles. The natural wood kitchen island and polished concrete countertops are all eye-catching elements that lend contrast. A single warehouse pendant light provides task lighting. The narrow bar stools add a pop of room brightening color plus; they also fit neatly under the counter when not in use. If you want to avoid creating a gloomy, dark space, we think black kitchens work best in sun-drenched spots. Case in point, this lovely example by U.K. based Devol Kitchens. The window, which overlooks the front yard, dictated the placement of the charcoal black cabinets and stainless steel appliances. The countertop is Statuario marble, which is considered the most precious out of all the different types of marble. The hardwood floor is oak. This beautiful black kitchen by April Tomlin Interiors is brimming with edgy ideas. The crisp, clean shaker cabinets are both classic and modern. The marble herringbone tile backsplash lends pattern. The open shelves are also black marble. For contrast, the homeowner selected white marble countertops. Over the kitchen island are two brass polyhedron pendant lights. An utterly white kitchen can feel too stark. That is why this lovely kitchen featured on Maison de Pax is two-toned. The black base cabinets couple beautifully with the white shiplap walls. The butcher block countertops lend natural warmth to the cooking space. The Turkish rug is a welcome shot of bold red color. The comfortable modernist is one of the many looks offered by interior designer firm Homepolish. The black cooking space in this New York City apartment is exemplary of the style. The matte cabinets have chrome hardware. The backsplash and counter surrounding the sink are gorgeous, white marble. The kitchen island features a charcoal quartz countertop. The luxurious brown leather bar stools bring warmth and tactile appeal. The objective for interior designer Sean Carlson Perry was to create a modern cooking space with a masculine vibe. To accomplish the mission he stuck with timeless kitchen pieces in contrasting shades. The coal shaker cabinets anchor the room. Dark gray grout makes the white subway tile pop. The countertops are super durable marble-look quartz. The retro warehouse pendant lights pour on industrial style. Lastly, the retro bar chairs enhance the kitchen's macho appeal. Here is a do-it-yourself kitchen update by Patricia Goijens, the DIYer who pens No Glitter, No Glory. She gave her cooking space a quick refresh with paint. The cabinets, shelves, walls, and refrigerator were treated to several coats of Pitch Black by Farrow & Ball. The result is a timeless kitchen that makes a chic statement. Trevor Brown Architects created a texturally rich cooking space by combining a mix of unexpected materials. The sleek, handle-free kitchen cabinets are meticulously modern. The exposed brick wall is an original building feature. The polished concrete kitchen island adds rugged character. The industrial-inspired black kitchen in this San Francisco condo remodeled by Bailey General Contracting is a mash-up of new and vintage pieces. The distressed cabinets doors are reclaimed wood from a local salvage yard. The new, oak cabinets are stained a shade called espresso black. The countertops are glossy gray quartz. The industrial drafting stools are vintage. The DIY pendant lights are made up of found pieces. Chalkboard paint turned the wall on the left into a whimsical feature. The black, push to open cabinets in this L-shaped cooking space by Space Craft Joinery provide tons of hidden storage while also concealing several appliances. The open maple shelves are a pleasing contrast. The geometric backsplash is made up of painted wood tiles. Interior designer Maureen Karsenty remodeled the kitchen in this Paris apartment. She coupled matte black cabinets with a glossy tile backsplash. Installing the subway tiles vertical is an unexpected touch. Do not be afraid to mix metals in a black cooking space. Here brass cabinet knobs coordinate nicely with the butcher block countertops while the chrome faucet and nickel pendant lights are a beautiful match. This small, sun-drenched home in Portland, Oregon was once a single room library. Jessica Helgerson Interior Design handled the renovation. The stunning kitchen features black walls and inky cabinetry. Together they provide the perfect backdrop for the retro white oven and Carrera marble backsplash. The countertops are marble look quartz. Heat up a neutral black kitchen with attractive warm accents. In this 1970s inspired cooking space by architecture and interior design practice Atticus & Milo, a kitchen island and upper cabinets both in yellow offset the dark walls. The terra-cotta brick floor injects a sense of coziness to the sleek modern space. 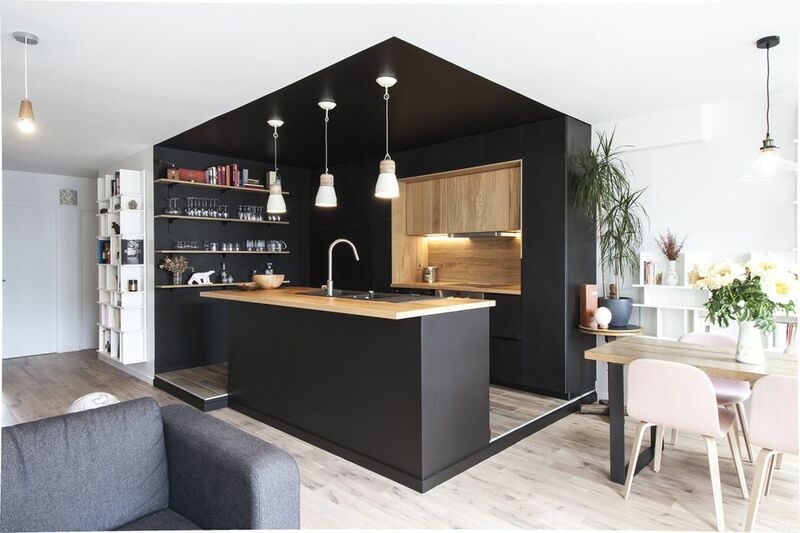 The task for Black Lacquer Design when remodeling this apartment for a busy bachelor was to achieve a look that felt both modern and welcoming. The blue and black kitchen scores high marks for its inviting, stylish appearance. The dramatic countertops and backsplash are high contrast marble with icy-white veins. The team behind Danish interior design firm Nicolaj Bo are known for their custom storage solutions. When creating this kitchen, the black cabinets were designed to fit the proportions of the space. The outcome is an efficient kitchen layout that optimizes every square inch with useful storage. We worship unique open floor plan ideas like this for instance by Trevor Brown Architects. The room, which combines the large kitchen with the central living area mixes vintage furniture and various accents with modern, black cabinets. The countertops are polished concrete. After installing fingerprint-resistant laminate cabinets in black, Nina Holst, the style blogger behind Stylizimo created a chic, wood backsplash on the cheap for her kitchen. First, she cut a piece of plywood to size. Then she applied a black wood stain, which showed off the board's natural grain. The final step before installing was protecting the new backsplash with a matte, water repellent sealer. Teal and black are the dramatic ingredients in this chic French kitchen photographed by Francois Guillemin. The countertop and backsplash are both white, Calacatta marble. The colorful rug lights up the room with mood lifting hues. This black cooking space by Parker Bathroom and Kitchens proves that the dark shade works with every color of the rainbow. Against the glossy back wall is a colorful set of cabinets in navy, orange, lime, red, and magenta. The base cabinets are a matte, steely gray. The countertops are glossy black quartz. Maureen, the blogger who pens, Red Cottage Chronicles refreshed her neutral white and gray kitchen with a matte black sink. The apron front basin is a granite composite. FYI, the material is more durable than fireclay. This moody kitchen spotted on BTL Property London has a back wall stocked with six-foot tall cabinets. The slick, black countertop is quartz. The gray kitchen island brings contrast. The brass globe pendant lights illuminate the work area. The couple who owns this historic home in Kent, England hired the design team at The Vawdrey House to bring their antique kitchen into the 21st century. The result is a thoroughly modern, black paneled cooking space. The white kitchen island is topped off with Carrera marble. To save a little money, the client went with a butcher block countertop against the back wall. There is no doubt that retro kitchens have an enduring style. But the trick is to create a space that does not look stuck in time. Here, interior design team Kandrac Kole installed timeless, black shaker cabinets. The red oven is a new, vintage-inspired appliance by Big Chill. The crisp, white subway tile backsplash provides the perfect backdrop. Here is a modern farmhouse kitchen by the design firm Fawn Interiors. The beautiful cooking space is chock-full of modern conveniences such as the AGA white electric range. The brush strokes on the black cabinets were purposefully created to enhance the space's rustic vibe. Ban Architecture transformed a sad, old kitchen dating back to the 1960s into a daring new cooking space. The black walls and kitchen island are black Valchromat, a wood fiber based material that is a solid color throughout — What does that mean exactly? Scratches, dings, and drill holes will be the same color as the board's veneer. For contrast, the shelves, backsplash, and countertops are natural wood treated with a water repellent sealer.